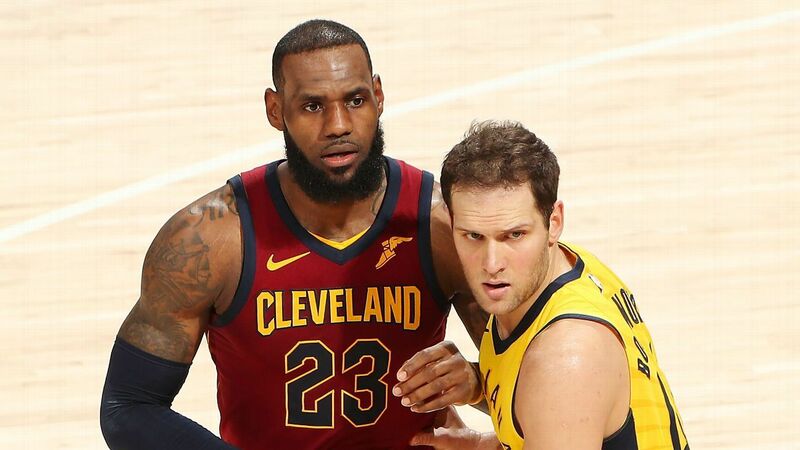 Tall, handsome, quick and versatile, Bojan Bogdanović is an accomplished basketball player who plays as a shooting guard for the Indiana Pacers. Born in a war thorn Bosnia Herzegovina, the odds were highly stacked against his dreams of becoming a professional basketball player, but he never gave much thought to it and focused solely on the beautiful game. The forward who wears the number ‘’44’’ Jersey for the Eastern Conference Central division side, can be regarded as a fan favorite, not because of his blistering form over the years, but as a result of a step up in his overall gameplay ever since “the Pacers” star man, Victor Oladipo was sidelined in January 2019 as a result of an injury in his knee. Read on to know more about Bojan Bogdanović. Bojan Bogdanović was born on April 18, 1989, In Mostar Bosnia and Herzegovina in the former Socialist Federal Republic of Yugoslavia. He is of Croatian nationality and white ethnicity. His basketball career started at the tender age of 15 when he played for a local club called Zrinjski Mostar. Following an impressive season with the team, he was offered a Five-year contract by Real Madrid which he penned his signature to with pride but was loaned back to Zrinjski Mostar a few weeks later. After his loan deal came to an end, he returned back to Real Madrid Where he was asked to play for Real Madrid B (real Madrid junior team), In the Liga EBA. Just when it seemed his fortunes were changing, he was again loaned to CB Murcia for the 2008/2009 season but his outstanding performance saw him recalled by Real Madrid as early as January 2009. Having completed the 2008/2009 season with Real Madrid he decided to continue his career somewhere he will be more appreciated. Moving on, Bojan Bogdanović signed a four-year contract with Croatian league outfits BC Covina in August 2009 and remained with the team until June 19, 2011, when he got signed by Fernabache Ulker. Later that year, he was selected 31st overall in the 2011 NBA Draft and was sold to Brooklyn Nets on Draft Night. However, following a misunderstanding in contract talks, he returned to Fernabache where he played for an additional two seasons until July 20, 2014, when he signed a Four year deal with Brooklyn Net. Not new to switching teams, he was traded to Washington Wizard on February 22, 2017, but just less than five months later, he was shipped to Indiana Pacers and he has been blazing for the side since then. Without mincing words, Bojan Bogdanović is clearly not the same player he was seven years ago and he has no one to thank except himself for all his hard work and dedication towards the game. Right after joining Brooklyn nets in the 2014/2015 season he made 19 straight starts but a dip in form saw him lose his starting spot on the team in December 2014 and eventually regain it in January 2015. On April 15, he recorded a career-high 28 points against Orlando Magic. The following season he scored a team-high 22 points against the Houston Rockets. March 15, 2016, saw him record an all-time career high of 44 points in a keenly contested game against the Philadelphia 76ers making him the highest scoring Brooklyn player since Deron Williams in 2012. Upon moving to Indiana Pacers in 2017 Bojan Bogdanović scored 14 points on his debut game against the Brooklyn rockets. The following season he was awarded the Eastern Player of the week award for his amazing performance in week 17. During the course of his NBA career so far, he has played a total of 318 games, started 201, 12.1 points per game and 3.2 rebounds. As he is still in his prime, it’s only normal for one to expect Bojan to surpass his current achievements in the nearest future. Since moving to Indiana Pacers in 2017, Bojan Bogdanović has risen fast to become a very important player for the Eastern Conference Central Division side. For his massive contribution to the team, he earns a whopping $10,500,000 annually in the form of salary, thereby making him the fourth highest paid Indiana Pacers player behind – Victor Oladipo, Thaddeus Young and Tyree Evans. The 6 ft. 8 inches Croatian national has an estimated net worth valued at $32 million.